I know it is almost 90 degrees outside but I still marvel at how fast the summer of 2018 is passing. The Minnesota State Fair is less than a week away. You all know what that means. The kids will be back to school and we will be contemplating all the festivities of the Holidays. Thanksgiving, Christmas and the New Year will be upon us before you know it. Let me suggest some helpful advice to help reduce some of your workload during the Holiday Season. 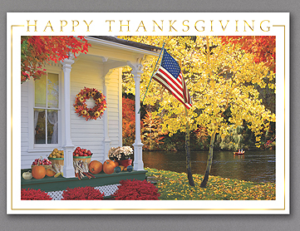 If you are one to send out Holiday Greetings I want to suggest that you consider Thanksgiving Greetings. 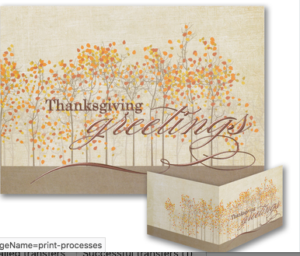 Whether your purpose is to send personal cards to friends and family or if you are a business wanting to express your thankfulness for new business as well as customer loyalty. It is a great way to keep in touch with customers and keep your name in front of them. Now is the time to act. 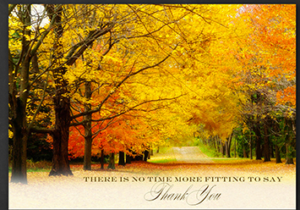 Visit our website at Invitations For Less and view hundreds of great greetings examples such as the ones shown below. In my next post we’ll take a look at some examples of Calendar Greeting Cards. A calendar card is even better for keeping your name and phone number in front of loyal clients as well as prospective customers all year long.